Posted by Jill (@bonnjill) in Business practices, Tools, Translation Sites. No sooner do you announce that you are slow, and the work comes pouring in… I am translating a couple surveys today and using both my electronic dictionary interfaces (Langenscheidt and UniLex) and Leo.org to look up words I’m unsure of or can’t immediately come up with. Working with electronic dictionaries and web-based glossaries and dictionaries sure have made our lives easier. Most of my colleagues agree that they rarely reach for bound dictionaries anymore. It is so much quicker and easier to highlight a word and use a keyboard shortcut to paste it into an electronic dictionary interface. Back when I still thought the ATA accreditation (now called ‘certification’) exam was worth taking I bought lots of bound dictionaries to bring with me to the exam. Now I rarely reach for a dictionary if I have it in electronic form or can easily look up a term on Google. It is also so easy to work anywhere, because I can pop the translation on my laptop and use all my electronic dictionaries without having to schlepp my heavy dictionaries with me. That is one of the main reasons I stopped working for the FBI – having to drag all my dictionaries in with me (well, that and not being given access to the Internet). Now it isn’t a problem to head to a coffee shop or restaurant with WiFi or travel to Germany or my sister’s to babysit and not be at a disadvantage. I remember dragging dictionaries with me to several ATA conferences because I had some translations to finish before I could enjoy myself. I love my Langenscheidt and UniLex interfaces. I have four dictionaries each installed on them and, after updating the UniLex and changing a setting under Options, am able to search all the dictionaries in the interface at once. My Langenscheidt dictionaries include the Handwörterbuch, Fachwörterbuch der Mikroelektronik, Fachwörterbuch Telekommunikation, and Peter Schmitt’s Fachwörterbuch der Technik und angewandte Wissenschaften (one of the best technical dictionaries out there). 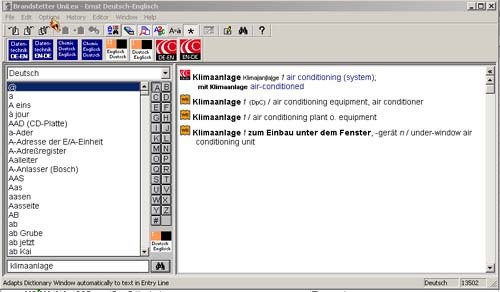 The UniLex interface allows me to quickly access to the Collins/Pons Unabridged German to English Dictionary, Ernst Wörterbuch der industriellen Technik (a good technical dictionary, which I also have in bound form), Brinkmann/Blaha Daten- und Kommunikationtechnik (Data Systems and Communication Technology) Dictionary, and Kucera Dictionary of Chemistry. I ordered the latest electronic version of the Großer Eichborn from UniLex yesterday. I am seriously considering buying the electronic version Dietl/Lorenz Dictionary of Legal, Commercial and Political Terms as well to make my life easier because it takes so long to pull the dictionary off the shelf next to me and find the word I need. Time is money and the more words you can translate an hour the more you earn! If a term isn’t in any of the dictionaries in the one interface it is usually in the other. I also like to check both and compare all the suggestions in order to choose the most suitable one. I won’t entirely stop buying bound dictionaries, because a) some are still only available in hard copy and b) I am a dictionary addict and they look so great on the shelf. But if given the choice I will always choose the CD-ROM. First of all, how cool is it that you’ve given screen shots of that software. Half the time I think a good screen shot is the main thing that sells software. Thanks for including those things. I wonder what other languages these publishers offer CD ROM products in–I’ll have to check it out. I chuckled at your line “Back when I thought the ATA accreditation exam was worth taking.” I urge young translators not to bother with it, actually, since no agency will accept it on face value of your ability to translate and it doesn’t really reflect the real world very well anyway… I remember back when I took my exam: I came in with a roller suitcase with about 25 dictionaries in it. I ended up using only 3 of them. I have taken the exam three times and failed each time by mere points. I made a huge stink a few years ago about the fact that no one had passed in German-English or English-German over the course of an entire year, and the ATA Board even officially discussed it. I think they loosened the test a little after that, but I was done with it by then. I had wasted enough money. I passed the FBI test, which I feel is much more extensive and more difficult (three-part exam that tests oral and reading comprehension, speaking ability and translation skills), and have an M.A. in translation, so my clients know I can translate. The fact that I am overworked proves it – not initials after my name or a certificate that I have to maintain every three years by earning continuing education points. I do continuing education for my own benefit – not my organization. With a 20% overall pass rate (they won’t give out the pass rate in the individual languages) I always warn those who think about taking it that they should take the practice test first to see how they do. It was an expensive lesson for me to learn. However, some people feel it adds benefit when marketing themselves if they don’t have an M.A. in translation or something else they can use to make themselves stand out from the pack. I have lots of friends who are certified; it just isn’t for me.